This was the year then-Manchester United winger Cristiano Ronaldo really emerged as a true world-class talent — with 35 goals in 58 games in all competitions for club and country. Ronaldo turned 23 early in 2008 and went on to a clean sweep of the young and senior PFA and FWA Player of the Year prizes in England, win a first Golden Shoe as Europe’s top scorer for 2007-08 and then take his first Ballon d’Or and FIFA World Player of the Year awards. There were goals in the round of 16, quarterfinal, semifinal and final as United won the Champions League [although he missed a penalty in the decisive shootout against Chelsea]. There were also persistent rumours about a move to Real Madrid, although that transfer was postponed for 12 months. Ronaldo began 2009 by again scoring in each of the Champions League knockout rounds, before being frustrated as United were beaten in the final by Lionel Messi’s Barcelona. He did however win a third straight Premier League title before joining Madrid in a world record £80 million transfer. On arrival at the Bernabeu, he became the first player to score in each of his first four games for Los Blancos, but injuries and some issues settling in Spain meant that he finished 2009 with *just* 30 goals in 49 games across all competitions. And he was *just* second in the year’s Ballon d’Or vote behind Messi. So far in 2016, Ronaldo has scored 51 goals in 54 games and won the Champions League and Euro 2016. Ronaldo’s first season in Spain ended without a trophy, but he was boosted by fellow countryman Jose Mourinho arriving as coach at the Bernabeu. In October he scored four times in a game for the first time, against Racing, as he accelerated towards a final total of 48 goals in 59 games over the calendar year — 45 for Madrid and three for Portugal. Yet there was also disappointment at the World Cup in South Africa, where Portugal lost out to eventual winners Spain in the round of 16 — and Ronaldo was pushed off the Ballon d’Or podium as Xavi Hernandez and Andres Iniesta were recognised alongside clubmate Messi. 2011 saw Ronaldo ramp up his goal scoring for both club and country, reaching the 60-goal mark for the first time in his career — including 53 in 52 Real Madrid games and seven in eight for Portugal. Personally, he won both a first La Liga Pichichi prize and a second European Golden Shoe (his first had been with Manchester United) — and, at the age of 26, he became the first player ever to score 40 times in a Spanish top flight season. The next year saw Ronaldo score 63 goals, 58 for Madrid and five for Portugal, in a total of 71 games — the most matches he has managed in one season. That May brought success for Jose Mourinho’s Madrid team in La Liga, the only Spanish title Ronaldo has yet won, although nemesis Lionel Messi nabbed the Pichichi and Ballon d’Or awards again as the Argentine somehow managed an incredible 91 goals all season. Looking just at La Liga and the Champions League — 2012 was the year in which Ronaldo took most shots  and had the most chances . Although he was also relatively wayward as just 14.5 percent of his shots hit the net. While the first half of 2013 saw Ronaldo finish as the Champions League top scorer for a second time, it was not a happy time at the Bernabeu due to Mourinho leaving as coach in May. Things turned around under new coach Carlo Ancelotti, and Ronaldo ended the year in probably the best form of his entire career — including a wonderful hat trick in the 2014 World Cup playoff against Sweden — earning his second Ballon d’Or trophy. He finished with a total of 69 goals in 60 appearances for club and country, his highest year-end goal tally, and appeared to be scoring more goals from fewer attempts. Madrid reached their holy grail of La Decima and a 10th European Cup win, with Ronaldo famously removing his jersey after scoring a late penalty in a 4-1 extra-time win over Atletico. He also set a new record of 17 goals in one Champions League season. His total goals over this 12-month period were 61 — 56 in 51 games for Madrid and five in nine for Portugal — with the total slightly down from the previous year. But 2014 saw his highest ever chances per game (2.0) across La Liga and the UCL as well as most shots on target (138) and a career best conversion rate (19.2 percent). Injury hampered his contribution — especially during Portugal’s early World Cup exit as they failed to advance from Group G — but when he was fit, this was peak Ronaldo. The stats certainly show how he earned his third Ballon d’Or prize. It was an up-and-down year for Ronaldo, with Madrid failing to win any trophies. But he finished as joint-top scorer in the Champions League (alongside Messi and Neymar with 10) and won both the 2014-15 La Liga Pichichi and European Golden Shoe trophies. By December, he made it to 57 goals for club and country over 57 games — 54 in 52 for Madrid, and three in five for Portugal. Looking at the stats for La Liga and the Champions League, after turning 30, he was again taking more shots than the previous year (329 in total) but his conversation rate had fallen to 16.1 percent. 2015 also saw some barren spells followed by gluts — with five-goal hauls against both Granada and Espanyol, but by the autumn he had overtaken Raul Gonzalez to become Madrid’s all-time leading goal scorer. Raul had scored 323 in 741 games; Ronaldo managed 324 in just 310. Cristiano Ronaldo is the winner of the 2016 Ballon d’Or, the fourth time he has received the award. In early November, Ronaldo signed his new long-term deal at Madrid and proclaimed it to be his best year. In terms of team trophies, it most certainly has been — with Madrid winning the Champions League and Portugal stunning even themselves by winning Euro 2016. This has also been Ronaldo’s best scoring year for Portugal — as he netted 13 times in 13 games for his country. But across La Liga and the Champions League, this has been his lowest scoring year since 2008. Injury has been a factor in this — his 38 La Liga and UCL goals have come in just 41 club games — but perhaps more worrying as he nears 32 years of age is that he is also getting the lowest tally for chances per game (1.4). This is an easy option for just about anyone. Holding cash completely eliminates the risk of keeping your savings in a shaky bank. You can secure your cash by storing it in a safe at your home, or at a non-bank private vault facility. It means your savings won’t be gambled away by your banker on the latest investment fad. You can’t have your account frozen by any one of dozens of government agencies. And if something goes wrong with the banking system, your savings will survive untouched. While cash is a great hedge against problems in the banking system, precious metals are a fantastic hedge against problems in the broader monetary system. If the market ever wises up and realizes that all these pieces of paper passed off as money are simply worthless claims on bankrupt governments, OR there comes a day when central banks print the straw that breaks the camel’s back, you’ll want to make sure you own gold and silver. Gold is a real asset with a 5,000 year history of value and marketability, three times as old as the oldest paper currency still in use (the British pound). Now, like any form of savings, gold by itself doesn’t produce a rate of return. Cash in a bank account earns about 0%. Cash in a safety deposit box earns 0%. Gold in a safety deposit box earns 0%. Own profitable businesses managed by talented people of integrity, and buy them when the share price is below the company’s intrinsic value. Share prices go up and down day to day. But over the course of several years, wonderful, well-managed businesses perform extremely well in any environment. In the event of inflation, they go up in value. In deflation, they produce valuable cash flow. Even in a crisis, they’re the first to recover. Great businesses often pay steady dividends as well, so you can expect to earn healthy cash flow while honest, talented executives look after your savings. One of the biggest keys to success in poker, especially as you move up and play against better-skilled and more sophisticated opponents, is understanding what some might call the “meta game” or the significance of your own table image. When you play a tight style of play, people are naturally going to give you more respect. If you also play on the passive side, you will get even more respect when you finally make a bold play. Loose and aggressive players, on the other hand, have the exact opposite effect on the poker table. Most people assume that such players are bluffing much of the time and therefore they get called down much lighter. It is important to understand that any decent, thinking player is frequently making mental notes and judgments about your style of play. Furthermore, they are categorizing you as tight or loose, and aggressive or passive. Your play, whether you realize it or not, is creating an image that is influencing how the attentive players respond to you. It doesn’t matter what style of play you choose, the actions that you take are going to affect how people react and play their hands against you at the poker tables. Rule #1: Contrarianism takes courage. Everyone knows the essential investment formula: “Buy low, sell high,” but it is so much easier said than done, it might as well be a secret formula. The way to really make it work is to invest in an asset or commodity that people want and need but that for reasons of market cyclicality or other temporary factors, no one else is buying. When the vast majority thinks something necessary is a bad investment, you want to be a buyer—that’s what it means to be a contrarian. Obviously, if this were easy, everyone would do it, and there would be no such thing as a contrarian opportunity. But it is very hard for most people to think independently enough to risk hard-won cash in ways others think is mistaken or too dangerous. Hence, fortune favors the bold. Rule #2: Success takes discipline. It’s not just a matter of courage, of course; you can bravely follow a path right off a cliff if you’re not careful. So you have to have a game plan for risk mitigation. You have to expect market volatility and turn it to your advantage. And you’ll need an exit strategy. The ways a successful speculator needs discipline are endless, but the most critical of all is to employ smart buying and selling tactics, so you don’t get goaded into paying too much or spooked into selling for too little. Rule #3: Analysis over emotion. This may seem like an obvious corollary to the above, but it’s a point well worth stressing on its own. To be a successful speculator does not require being an emotionless robot, but it does require abiding by reason at times when either fear or euphoria tempt us to veer from our game plans. When a substantial investment in a speculative pick tanks—for no company-specific reason—the sense of gut-wrenching fear is very real. Panic often causes investors to sell at the very time they should be backing up the truck for more. Similarly, when a stock is on a tear and friends are congratulating you on what a genius you are, the temptation to remain fully exposed—or even take on more risk in a play that is no longer undervalued—can be irresistible. But to ignore the numbers because of how you feel is extremely risky and leads to realizing unnecessary losses and letting terrific gains slip through your fingers. Rule #4: The trend is your friend. No one can predict the future, but anyone who applies him- or herself diligently enough can identify trends in the world that will have predictable consequences and outcomes. If you identify a trend that is real—or that at least has an overwhelming amount of evidence in its favor—it can serve as both compass and chart, keeping you on course regardless of market chaos, irrational investors. Rule #5: Only speculate with money you can afford to lose. Spread betting is a derivatives product that allows you to trade on the price movements of thousands of financial markets including indices, shares, currencies, commodities and more. You can use spread bets to speculate on price movements irrespective of whether the markets are rising or falling. If you go long (buy), your profits will rise in line with any increase in that price. If you go short (sell), your profits will rise in line with any fall. Similarly, if you go long on the price and the underlying stock price falls, you will incur losses. Spread betting is a margin-ed product that only requires you to deposit a small percentage of the full value of your position. This means that the potential for profits, or losses, from an initial capital outlay is significantly higher than in traditional trading. The margin required is typically between 1% and 10% of the total value of your position, depending on the market. Just like other forms of trading, including traditional share dealing, we quote two prices for all our spread bets – a buy price (the price at which you can go long if you expect the underlying market to rise) and a sell price (the price at which you can go short if you expect the underlying market price to fall). The difference between the ‘buy’ price and ‘sell’ price is known as the spread. Some psychologists refer to the psychological biases that effect the way we act as judgemental heuristics. Judgemental, because they affect our decision making processes, with heuristics being shortcuts that allow us to sift through and sort out information in a short period of time. So, what is the sunk cost effect? In the world of economics, sunk costs are costs which have already been incurred and therefore lost for good. The sunk cost effect is the tendency human beings have to consider the amount of money already spent when making a decision. As an example, let’s say you’ve spent £1,000 on a pair of box seats to go and watch Manchester United. However, on the day of the game you have a genuine flu. Every part of your body aches. You desperately want to stay in bed. You know how it is. A rational and logical approach to this would be to completely disregard the money that has been spent and weigh up the pros and cons of dragging yourself to the game and probably not enjoying one minute of it or staying at home where you’ll be more comfortable. The rational outcome being that you stay at home. However, the sunk cost effect causes decision makers to put too strong a meaning on the money already spent. It causes a decision maker to go to the game regardless of how they feel because they have spent £1,000 on the tickets. How does this example lend itself to trading psychology? Well, let’s suggest a person new to spreadbetting has a £1,000 account and takes out a long position in a popular UK stock. Let’s go for Vodafone for no reason other than it’s a well known and heavily traded UK stock. Now let’s suggest that this new spreadbettor enters that trade at £1 per point with a 100-point stop loss. They are therefore risking £100 on the trade as this is the amount they will lose if their stop loss is hit. After a few days pass, the price of Vodafone has fallen by 50 points and they are therefore £50 down. A few more days pass and the price falls down to -100 points. They are now £100 down and have lost 10% of their account in this one trade. Consider how the sunk cost effect might affect that trader’s decision to at this point lower their stop loss and give the stock even more room. They have already committed 10% of their account to this trade. The sunk cost effect will influence the trader’s rational thinking. Instead of staying committed to their previously designated exit the trader may look for ways to avoid wasting the £100 already spent on the trade by lowering their stop. The question then is what the trader does when their position falls to a -£200 loss. As you can see, it can often be a downward spiral. The longer the trader holds their position the more they are at risk of losing to the trade and this is one of many ways new traders can find their accounts disappearing very quickly. What was initially a potential £100 loss has turned into a potential £200 or even £300 loss (30% of their account). This is until the trader finally gives in from sheer panic and distress and finally closes the trade! The way to avoid all of this is of course to pre-define your exit before you even place your trade and then, even more importantly, stick to this plan. Overcoming these psychological barriers which affect your trading can have a significantly positive effect on your long term performance as a trader Spreadbetting the financial markets. New investors often don’t know what a “good” rate of return is on a well-constructed long-term portfolio. The answer depends on how the portfolio is constructed and varies by asset class. One of the main reasons new investors lose money is because they chase after unrealistic rates of return on their investments, whether they are buying stocks, bonds, mutual funds, real estate, or some other asset class. This happens due to a lack of experience. Most folks just don’t understand how compounding works. Every increase in percentage profit each year means huge increases in your ultimate wealth. To provide a start illustration, $10,000 invested at 10% for 100 years turns into $137.8 million. The same $10,000 invested at twice the rate of return, 20%, does not merely double the outcome, it turns it into $828.2 billion. It seems counter-intuitive that the difference between a 10% return and a 20% return is 6,010x as much money, but it’s the nature of geometric growth. So What’s a Good Growth Rate? When it comes to answering what a “good” rate of return on your investments is, I find myself frequently reiterating the truism that past performance is no guarantee of future results, and that even the best-structured portfolio or investment plan can result in permanent capital losses. I think about risk a lot. It’s in my nature. In fact, I believe people don’t think about risk enough. Things like the total decimation of the Austrian stock market upon the annexation of Austria by Nazi Germany have happened, can happen, and will happen again at some point in the future. There are no guarantees of any kind in life. With that said, I think the only reasonable, academic position a person can take if they assume that civilization will remain relatively stable is to answer that determining a “good” rate of return on your investments is probably easiest if we examine the nearly 200 years of data from Ibbotson & Associates, a data research firm that tracks financial market history. It’s not perfect for the reasons we just discussed, as well as several others, but it’s the best we have. To accomplish this, the first thing we need to do is strip out inflation. The reality is, investors are interested in increasing their purchasing power. That is, they don’t care about “dollars” or “yen” per se, they care about how many cheeseburgers, cars, pianos, computers, or pairs of shoes they can purchase. Gold: Typically gold hasn’t appreciated in real terms over long periods of time. Instead, it is merely a store of value that maintains its purchasing power. Decade-by-decade, though, gold can be highly volatile, going from huge highs to depressing lows in a matter of years, making it far from a safe place to store money you may need in the next few years. Use Gold as an insurance over time. Cash: Fiat currencies are designed to depreciate in value over time. In fact, $100 in 1800 is worth only $8 today, representing a loss of 92% of value. Burying cash in coffee cans in your yard is a terrible long-term investing plan. If it manages to survive the elements, it will still be worthless given enough time. Bonds: Historically, good, quality bonds tend to return 2% to 4% after inflation in normal circumstances. The riskier the bond, the higher the return investors demand. Business Ownership, Including Stocks: Looking at what people expect from their business ownership, it is amazing how consistent human nature can be. The highest quality, safest, most stable dividend-paying stocks have tended to return 7% in real, inflation-adjusted returns to owners for centuries. That seems to be the figure that makes people willing to part with their money for the hope of more money tomorrow. Thus, if you live in a world of 3% inflation, you would expect a 10% rate of return (7% real return + 3% inflation = 10% nominal return). The riskier the business, the higher the return demanded. This explains why someone might demand a shot at double- or triple-digit returns on a start-up due to the fact the risk of failure and even total wipe-out are much higher. To learn more about this topic, read Components of an Investor’s Required Rate of Return. Real Estate: Without using any debt, real estate return demands from investors mirror those of business ownership and stocks. The real rate of return for good, non-leveraged properties has been roughly 7% after inflation. Since we have gone through decades of 3% inflation, over the past 20 years, that figure seems to have stabilized at 10%. Riskier projects require higher rates of return. Plus, real estate investors are known for using mortgages, which are a form of leverage, to increase the return on their investment. The present low-interest rate environment has resulted in some significant deviations in recent years, with investors accepting cap rates that are substantially below what many long-term investors might consider reasonable. There are some takeaway lessons from this. If you’re a new investor and you expect to earn, say, 15% or 20% compounded on your blue chip stock investments over decades, you are delusional. It’s not going to happen. That might sound harsh, but it’s important that you understand: Anyone who promises returns like that is taking advantage of your greed and lack of experience. Basing your financial foundation on bad assumptions means you will either do something stupid by overreaching in risky assets, or arrive at your retirement with far less money than you anticipated. Neither is a good outcome, so keep your return assumptions conservative and you should have a much less stressful investing experience. What makes talking about a “good” rate of return even more confusing for inexperienced investors is that these historical rates of return — which, again, are not guaranteed to repeat themselves! — were not smooth, upward trajectories. If you were an equity investor over this period, you suffered sometimes jaw-dropping, heart-pounding losses in quoted market valuation, many of which lasted for years. It’s the nature of dynamic free market capitalism. But over the long-term, these are the rates of return that investors have historically seen. 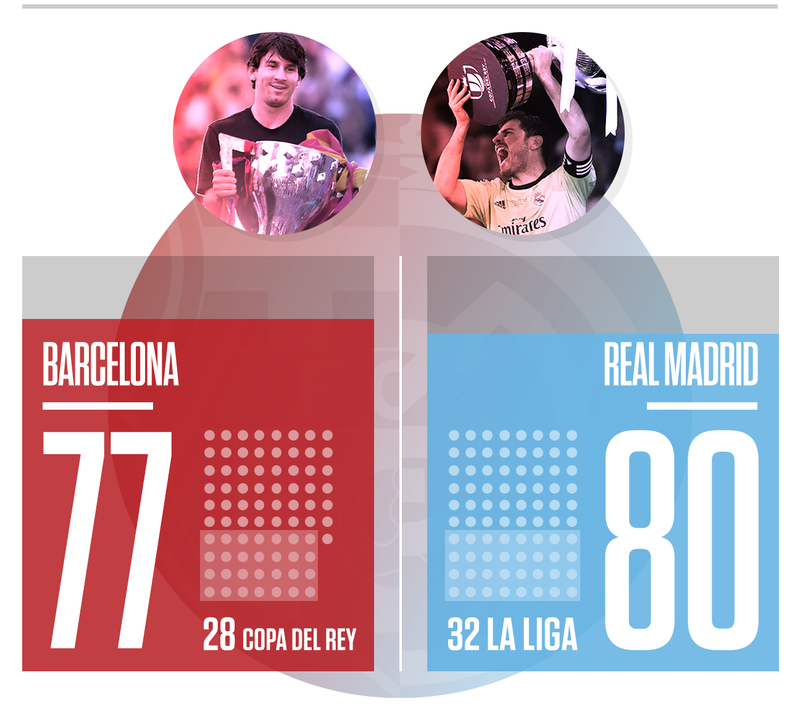 El Clasico is arguably the biggest game in club football each year, but just how does it rate against other big matches? 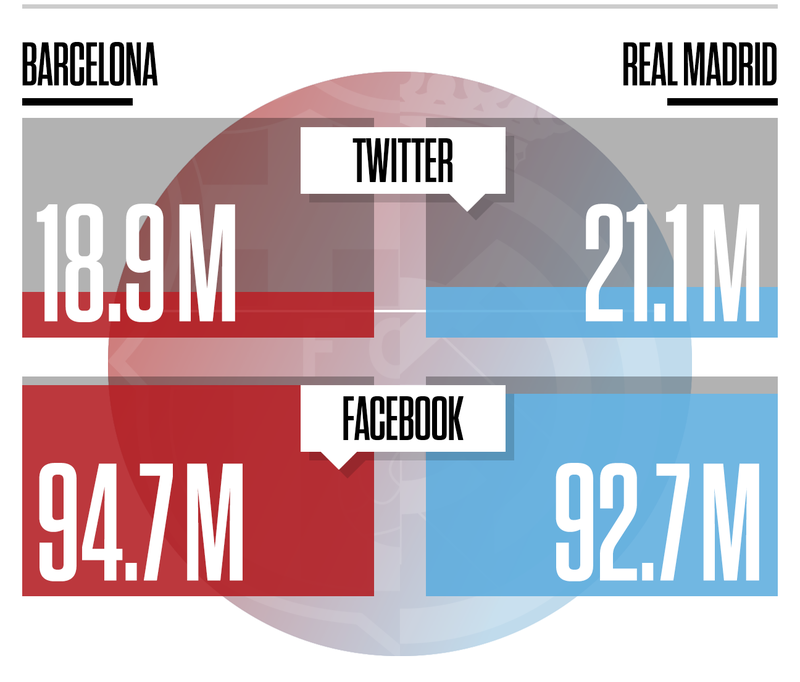 Plus, how do Barcelona and Real Madrid compare with each other, as well as with other clubs? 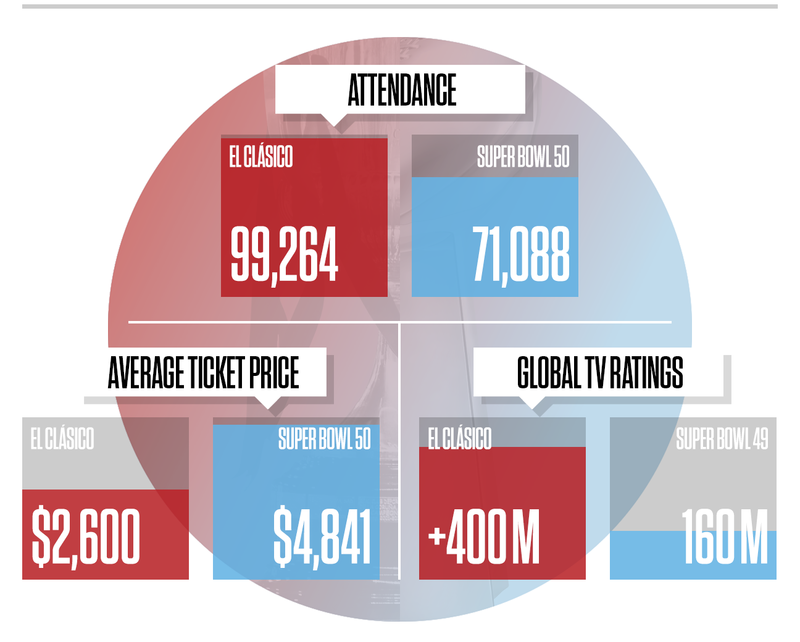 When El Clasico is on, the world really is watching. 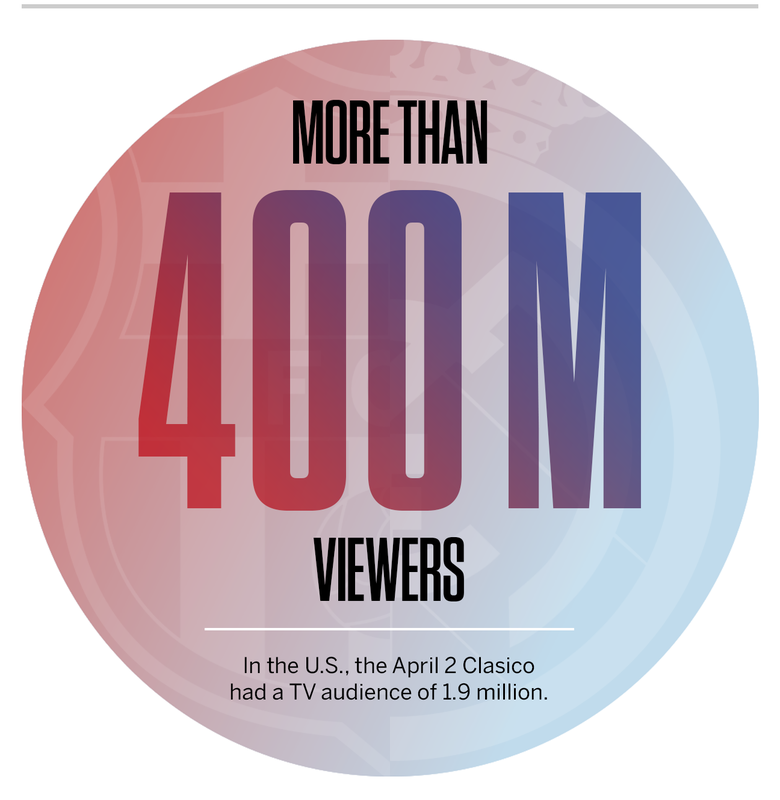 The most recent Barcelona-Real Madrid clash, in April 2016, aired in more than 90 countries around the world. 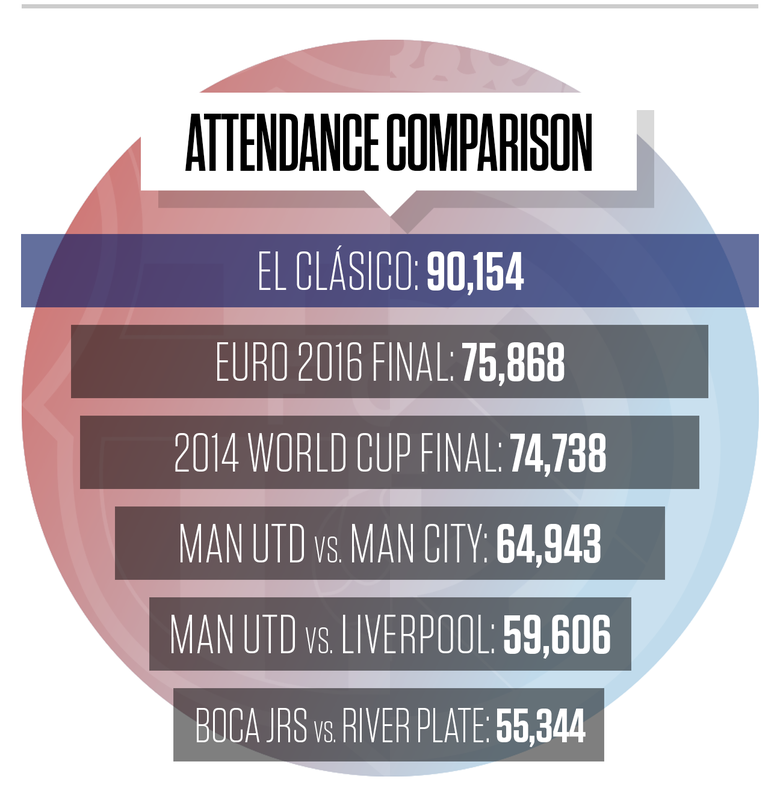 When it comes to supporters inside the stadium, El Clasico is unparalleled. Last season, more than 30,000 more fans attended Barcelona’s games with Real Madrid than any other game between major football rivals. The first meeting, at Madrid’s Bernabeu had an attendance of 81,044 while the second, at Barcelona’s Camp Nou, drew a crowd of 99,264. 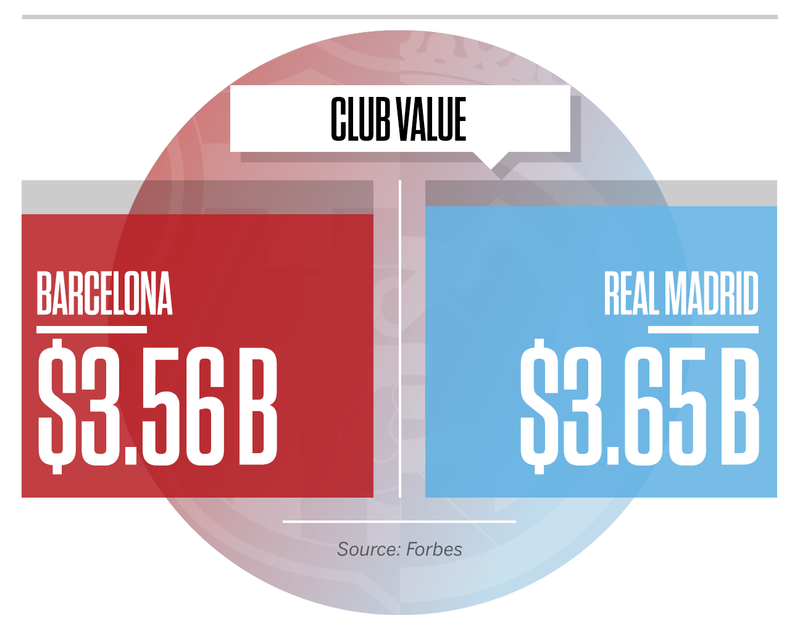 According to Forbes, these are two of the top three most valuable sports clubs in the world. Only the Dallas Cowboys are ahead of them. 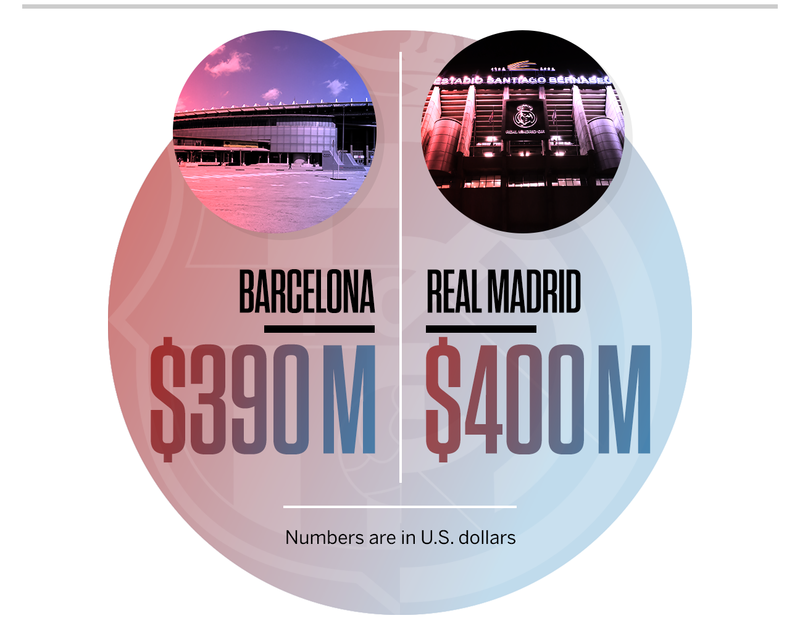 After Barcelona and Madrid, the next club on the list is Manchester United at $3.3 billion. Neither club is averse to spending big money to get the players they want. In fact, between them, they have broken the world transfer record eight times. The two most expensive players in the current Clasico squads are Neymar and Gareth Bale, although the latter will miss Saturday’s game through injury. Playing for these clubs is lucrative. 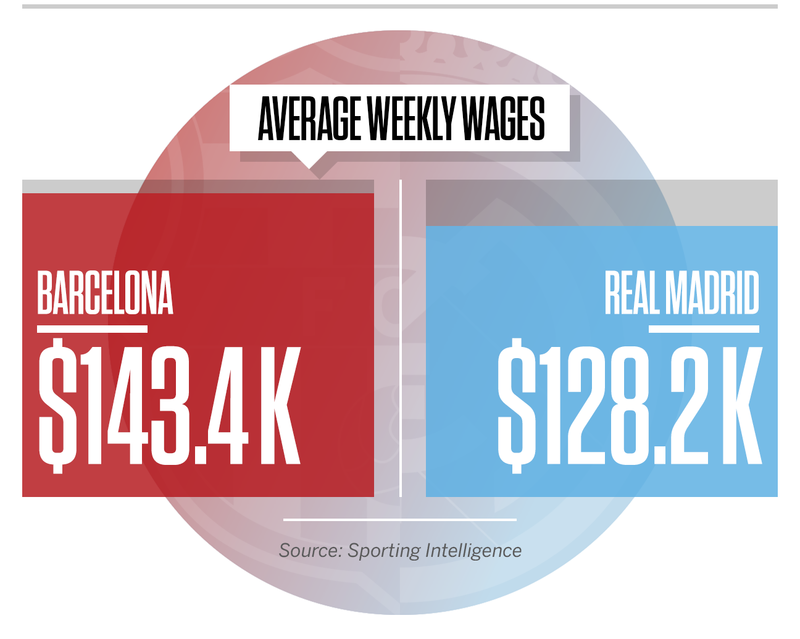 According to a Sporting Intelligence survey covering all sports, Barcelona are fifth-placed in terms of total annual salaries paid, while Madrid are ninth. Only Manchester United place above them among football clubs; the Cleveland Cavaliers of the NBA are the top-paying team. Their best-paid player is LeBron James, who earns almost $31m per year. 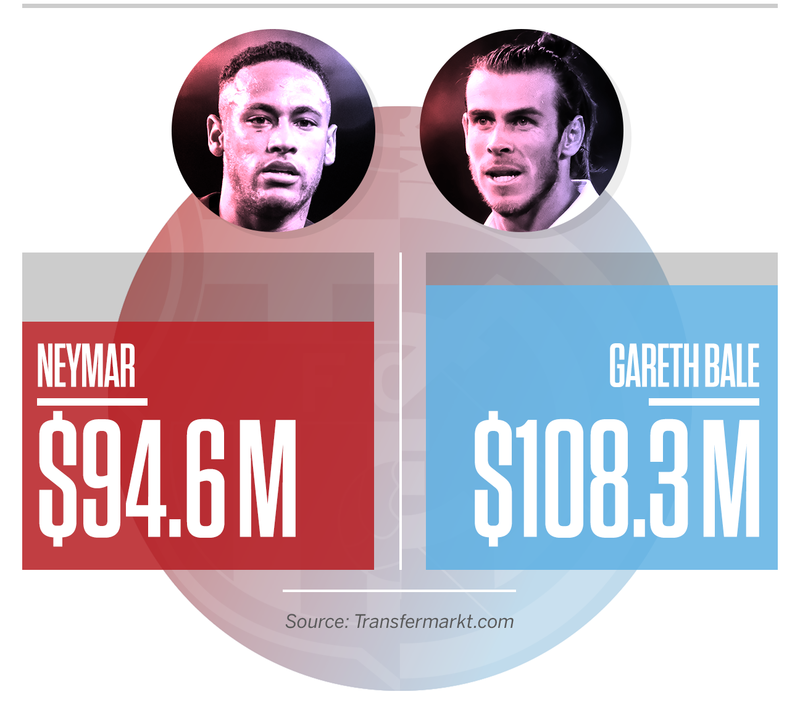 Compare that to Lionel Messi and Cristiano Ronaldo, both of whom earn almost $24 million, or $450,000 per week. 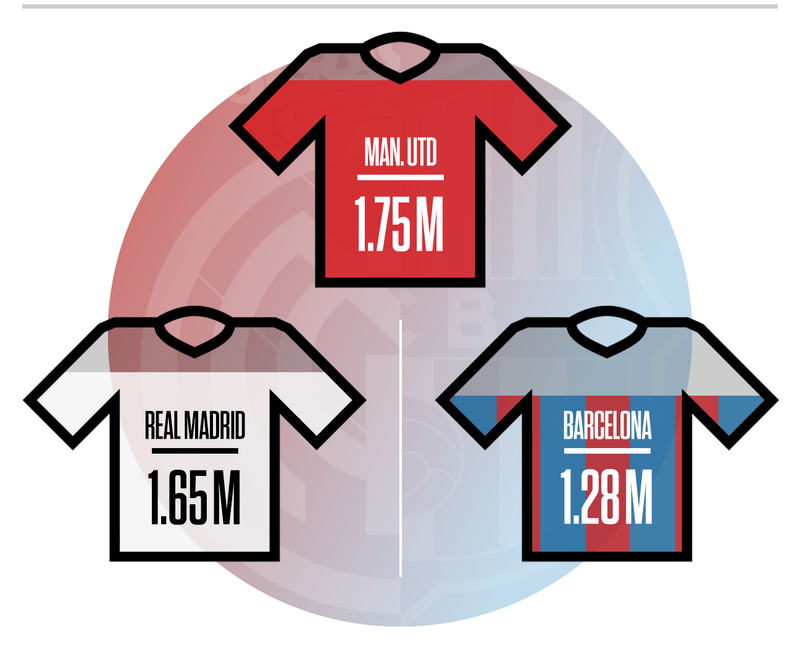 Measuring just how many fans clubs have around the world can be tricky but, based on a recent survey of shirt sales, Barcelona and Real Madrid trail only Manchester United in terms of global popularity. When it comes to silverware, the two clubs are on top of the world. In terms of La Liga and the European Cup, Real Madrid have 32 and 11 wins respectively — both competition records — while Barcelona have 24 and five. 2014 was another action-packed year of sport – and for betting. Some of the big stories in the sports world also made for moments to savour – or to forget – for punters. Take a look at our top ten spread betting moments of the year below to gain betting inspiration for 2015! Most people will list Germany’s unforgettable 7-1 World Cup semi-final drubbing of hosts Brazil in their top 10 sporting moments of 2014, but for spread betters it was this slightly more low key European Championship qualifier that stood out. Germany sauntered to a 4-0 win but also took 20 corners during the game meaning spread betters who bought Germany Corners Squared at 173 made 227 times their stake when the market made-up at 400. Sellers on the spread were left feeling well and truly cornered themselves having lost 239 times their stake. The year started off with Australia completing a 5-0 Ashes whitewash thanks to a comprehensive 281-run win over a beleaguered England side in the final Test in Sydney. It was another forgettable moment for English cricket fans. But not for spread betters who got on Mitchell Johnson’s series bowling performance. Johnson took 37 wickets at the cost of 517 runs at an average of 13.97. Punters who bought his Bowler Series Index (10 points per wicket plus 25 point bonus for every five-fer) at 215 made 230 times their stake when the market made up at 445. Sellers were left as shaken as the England batsmen by the antics of the marauding, moustachioed Aussie. It was known before the start of the 2014 F1 season that Mercedes had adapted best to the new rules and had the dominant car with the best engine. Commentators knew they would be good. But did they know they would be that good? Lewis Hamilton and Nico Rosberg swept all before them taking 18 out of 19 poles and 16 out of 19 race wins. Spread betters who bought on Spreadex’s Mercedes Constructors’ Points spread at 456 made 245 times their stake when Mercedes eventually finished on 701. Sellers of the spread were left feeling the pits as they lost more than 250 times their initial stake. Aaron Rodgers broke a host of records with six first-half touchdown passes as Green Bay Packers beat Chicago Bears 55-14. Rodgers tied the team touchdown pass record with Matt Flynn, matched the NFL mark for a half set by Oakland’s Daryle Lamonica in 1969 and recorded his 16th scoring pass of 70 yards or more. Spread betters who bought Touchdown Yardage at 115 also had a great day making 305 times their stake when the market made up at 420. Sellers hit the endzone with this particular bet. One of the most popular football spread betting markets for Spreadex clients is Shirt Numbers – the shirt numbers of goalscorers in a game, aggregated. So when Ural and CSKA went head to head in this Russian Premier League game with players wearing shirt numbers as high as 88, 89 and 90 our traders knew there was potential for cargange. Sure enough CKSA won 4-3 with the goals coming from Manacharyan (10), Smolov (90), Erokhin (89), Dzagoev (10), Eremenko (25) and brace for Doumbia (88). Punters who bought Shirts at 71 made 329 times their stake while sellers were left to get a bit shirty themselves. There were some great games, great goals and plenty of colour in the stands – yes it was largely a memorable World Cup from Brazil. Unless you’re an England fan, of course. With Radamel Falcao injured, Colombia’s James Rodriguez stole the show to end up as Golden Boot winner with six goals and earn a lucrative move to Real Madrid. Spread betters who bought his tournament goal minutes at 61 were also in the money as they won 341 times their stake. Any sellers would have been cringing every time the attacking midfielder found the net. The Grand National is traditionally the big race of the year for punters across the land and in 2014 fixed odds punters who backed eventual winner Pineau De Re at 25/1 would have been left punching the air with glee. However, for spread betters it was the opening day of the Grand National Meeting at Aintree that saw big profits for many. Spreadex’s extensive choice of spread betting Card Markets features the likes of Multi Mules (winning horse racecard number multiplied by second placed horse racecard number for each race at a meeting, aggregated) and Squared Numbers (winning horse racecard number squared for each race at a meeting, aggregated). So when results on day one included the likes of Warne (21) winning the 3.40pm with Tartan Snow (20) coming second followed by some other high racecard winners later in the day, it was a bumper payday for some horse racing spread betters. Buyers of Multi-Mules at 496 made 446 times their stake when this market made up at 942 while buyers of Squared Numbers at 638 made 398 times their stake when this market made up at 1036. Sellers of these markets were left feeling anything but grand. If James Rodriguez was the big surprise player of the World Cup then the Netherlands were certainly the surprise team of the tournament. Drawn with then World and European champions Spain, dark-horses Chile and Australia, many thought the Oranje would struggle to get out of the group. But a 5-1 trouncing of Spain followed by eventual elimination to Argentina in the semi-finals and then a third/fourth place play-off win over demoralised Brazil made it a tournament to remember for now-Manchester United boss Louis van Gaal’s side. It was also a bet to remember for spread betters who bought Holland’s tournament goal minutes at 271 as they made 642 times their stake. For sellers the future was definitely not orange. Cricket is one of the most popular sports to place spread bets on with the ebb and flow of team or individual batsmen runs offering the perfect opportunity to open and close in-play bets. However, there are also plenty of other cricket spread betting markets to bet on other than just runs with Multi 4s one of them (Team A 4s multiplied by Team B 4s). When India won the fourth ODI against Sri Lanka by 153 runs in Novemember, the hosts hit 47 fours along the way (Rohit Sharma with 33 of them) while Sri Lanka hit 29 themselves. Spread betters who bought Multi 4s at 630 made 733 times their stake while sellers were left feeling hit for six. 2014 was a great year for Northampton Saints as they bounced back from the heartache of defeat to Leicester Tigers in the 2012-13 final to beat Saracens 24-20 at Twickenham in May to lift the Premiership trophy. Along the way there were some scintillating performances, notably the 74-13 trouncing of London Wasps on the final day of the regular season. Saints ran in 11 tries in total and with the half-time score 27-13 it meant their Multi-Points (first half points multiplied by second half points) came in at a whopping 1269. Buyers at 337 made a huge 932 times their stake while sellers were left feeling well and truly stung. Between 1999, when gold bottomed at $250, and the 2011 peak at $1,920 there was only one major correction lasting 8 months in 2008. The ensuing correction from the 2011 top at $1,920 of almost $900 seemed to take an eternity until it finally finished in December 2015. During those four years it was always clear to me that the uptrend in the precious metals was still intact although I must admit that I did not expect a correction of that duration. But after a long life in markets, patience becomes a virtue that is absolutely essential. If your investment decisions are based on sound principles at the outset, there is no reason to change your opinion because the market takes longer to accomplish what it must do. And as we know, the financial system almost went under in 2007-9. With $25 trillion of printed money, credit and guarantees the system was given a temporary stay of execution. But these $25 trillion was just the initial package. Since 2006 global debt has increased by $90 trillion plus unfunded liabilities and derivatives of several hundred trillion dollars. This explosion of debt has confirmed the risks that we saw already back in 2002. Now entering 2017, the financial system seems that cannot survive intact. Global debt has gone from $20 trillion to $230 trillion, a more than 10 times increase in the last 25 years and none of this debt can be repaid with real money. Governments and central banks have totally run out of ammunition. In their desperate attempts to save the financial system, they have manipulated every single market and financial instrument. They print money, they set false interest rates (now negative), they buy their own debt, they support stock markets and they also sell gold in the paper market. All of this action or deceitful manipulation is just creating bigger bubbles that will eventually lead to a total implosion of the financial system and all the bubble assets such as stocks, bonds and property. In addition, bank stocks in Europe are now showing all the signs of going to zero. Most major banks are down 70-90% since 2006 and many have fallen 25% in the last few days. The European banking system is on the way to bankruptcy. And many U.S. banks like Bank of America and Citigroup are showing the same signs. The coming months will be extremely volatile and disruptive in world financial markets. But before the financial system implodes, there will be the most massive money printing program that the world has ever seen. They will need to print money in a final and futile attempt to save the bankrupt banks. With $1.5 quadrillion in derivatives outstanding, the printing presses (or the computers) will run hot. With Deutsche Bank’s derivatives at $75 trillion and JP Morgan at almost $100 trillion, only those two banks need support at 2.5 times global GDP. It is of course not just the financial system that will need support. Governments will run out of any significant tax revenue and will need to print money for all their expenditure. Remember that Japan, for example, already today prints 50% of its annual expenditure. Throughout history, gold (and sometimes silver) has been the only money that has survived. Every paper or fiat currency has always been destroyed by governments through deficit spending and money printing. In the last 100 years all major currencies have declined 97-99% against gold. It is virtually guaranteed that they will go down the final 1-3% to zero. But it must be remembered that this decline means a 100% fall from here. This final decline of the currencies will be reflected in the gold and silver prices. I am still convinced that we will see gold at $10,000 and silver at $500 and possibly in the next 5 years and that those levels will be reached even with normal inflation. But if we get hyperinflation, we could add quite a few zeros to the price. So from a wealth protection or insurance point of view, it is absolutely essential to own gold and some silver. And although I said that precious metals are primarily for a privileged few, this is actually not the case. In India, virtually everyone owns gold and many of the Chinese save in gold. Any ordinary person can buy, say, one gram gold or more a month. One gram is $40, which many people could afford to save monthly. Gold at $1,330 and silver at $19 is a bargain. But the metals will not stay at these low levels for very long. With the correction finished and the next uptrend in place, we could soon see the metals accelerate very fast. The problem is that there is very little physical gold available in the world and we have reached peak gold from a production point of view. With the massive outstanding paper gold position in the system, we will soon see the paper shorts running for cover. Once demand increases, it can only be satisfied by much higher prices.